QTY 12345678910111213141516171819202122 Please select a quantity. Bring a rustic cottage charm to your sitting ensemble by adding this Bench to it. 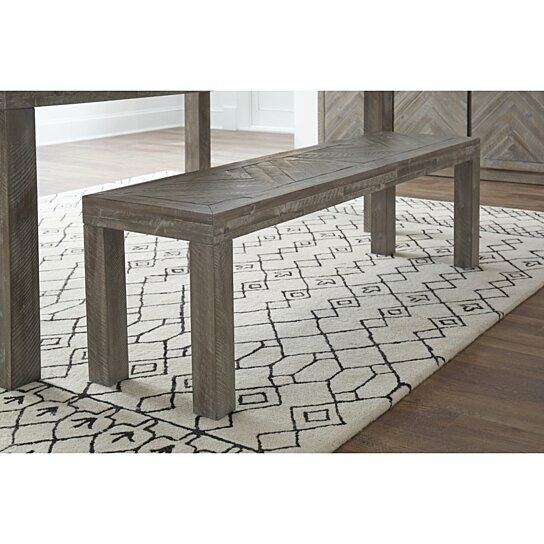 Made entirely from solid Acacia wood in a rustic brown finish, this bench features a distinctive herringbone inlay design on its seat that adds a unique combination of rustic charm and contemporary polish to your dining room. Add this bench to your living room for an effortless update to your seating ensemble or let it sit in the entryway to give guests a place to sit and kick off their shoes. It consists of one bench only. The bench features a distinctive herringbone inlay design on its seat. The bench has sturdy acacia wood construction that is built to last. The bench will add a unique combination of rustic charm and contemporary polish to your dining room.